This is a soccer passing combination drill that focuses on wingers combining with the center mid to advance the ball down the field. Create a grid about 20 X 40. Place two center midfielders inside the grid. The remaining players even out the lines on all 4 corners of the grid. 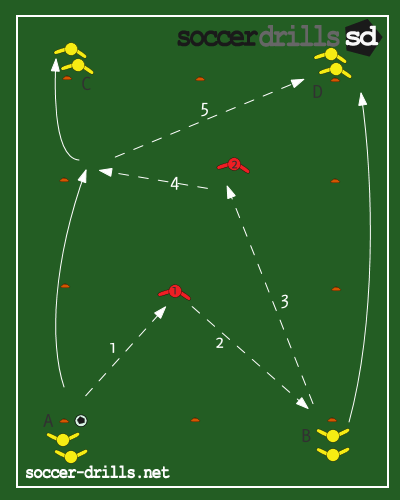 The first player in Line A passes into the first midfielder and makes a run down the line towards line C.
Midfielder 1 plays into the player at line B. The line B player plays into the second midfielder and makes a run down the line into line D.
Midfielder 2 plays into the run of player A who plays a diagonal pass into the player at line D.
The line D player receives the ball and plays into midfielder 2 and the play continues. Play in 1-touch or 2-touch passes. Precise passes with good weight on the passes. Passes should always be played in front of the running players.